The Constellation arrived in port prior to sunrise and it was lovely to see the port of Kusadasi at dawn as we approached the pier. The mountainous coastline was evident and we were excited to be in this gorgeous country once more. The Constellation was supposed to start this itinerary in Istanbul, but because of political unrest that port of call has been cancelled until further notice. We are extremely thankful to have visited Istanbul is the summer of 2015, on board the Celebrity Equinox. Turkey is an absolutely wonderful country with generous, hospitable residents. 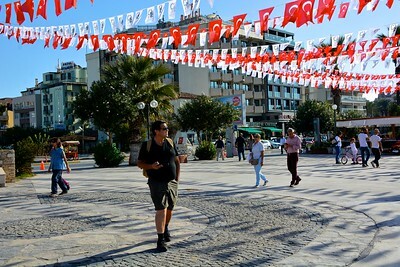 It is truly a shame that the current political unrest is affecting this country’s tourism trade which is a large part of local economies, such as the Port of Kusadasi. Via the cruise critic roll call, we joined an already formed small group tour, led by cruisers Bruce & Becky. 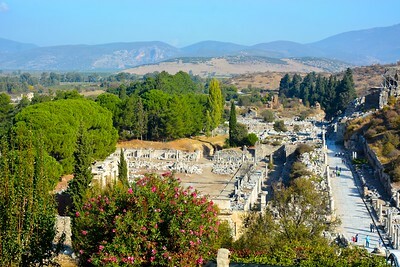 They had hired a guide from: Ephesus Tours and the plan was to visit Ephesus & the Terrace Houses, the Basilica of St. John and the Temple of Artemis. The tour also included a complimentary lunch at a Turkish Carpet Factory (Aladdin). Our first stop would be Ephesus, which was once the capital of Asia Minor and was the most important commercial centre of western Anatolia, and one of the seven churches of Christianity. Ephesus had been a religious centre of early Christianity and the apostles of Jesus, St. John, and St. Paul were known to visit this site to spread Christianity. The recorded history of Ephesus goes back to 14th Century B.C. and incredibly it is a well-preserved ancient city showcasing its landmark library, well preserved theatre, streets, fountains, and ever evolving Terrace Houses. Ephesus did not disappoint! Anthony & I commented that it was the largest, best preserved archaeological site that we have visited. 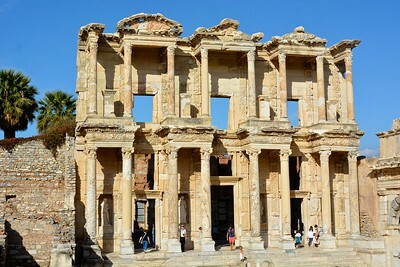 Our guide also pointed out for those who had visited Ephesus previously of all the new wonders that have been uncovered. They are still unearthing the wonders of this ancient city and it is a city that uncovers new ground each year, always keeping the city interesting for returning guests. We were very fortunate to meet up with an Archaeology University Professor who greeted us at the Terrace Houses. He was the “main guy” at the Houses and although not our guide, he was shared with us the history of the houses and its importance within Ephesus. An excellent learning opportunity that was appreciated by all of the guests on this tour. The Library of Celsus (Ephesus) is an ancient Romam building and was built in honour of the Roman Senator Tiberius Julius Celsus Polemaeanus. It is estimated that the library was completed between 117 and 120 A.D by Celsus’ son. The library was considered as one of the most impressive buildings in the Roman empire and it was built to store 12,000 scrolls. It also served as a mausoleum for Celsus, who is buried in a crypt beneath the library. The Library was the third largest library in the ancient world, third only to the magnificent “Alexandria” and “Pergamum”. Although the Library is mostly destroyed, the exterior facade does take your breath away as you view her from above, in front of, our inside looking up. It was well worth the visit to this beautiful ancient city, not only for the incredible Terrace Houses and the Library, but for the entire site that unfolded as you walked the ancient grounds of a wondrous city – following the footsteps of St Paul (more on that later!). After Ephesus, we also visited the Basilica of St. John, the Temple of Artemis, and a Turkish Carpet Factory where we had lunch. 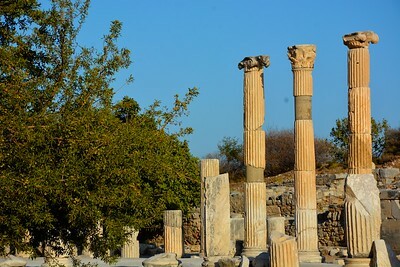 We enjoyed all that followed Ephesus, but Ephesus was clearly the stand out attraction. 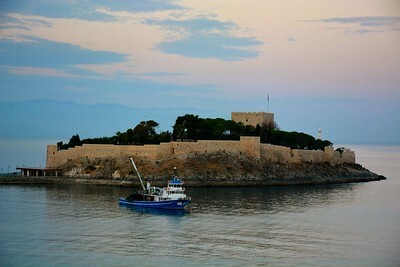 Following our tour, Anthony & I walked the boardwalk and enjoyed the views from the Port of Kusadasi. Our final stop was “Starbucks” where we were served a traditional Turkish Coffee with Turkish delights! what a great way to end an amazing day in Turkey.